It is the evening of 19th February, 1958. A crisp, rather bleak London evening. 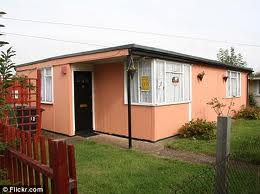 The first in a row of prefabs is number 48, Gaskell Street, Stockwell. In the living room are my parents, my sister, some aunts and uncles, our neighbours from either side and a few of my friends . The adults are drinking brown ale (men) or Bristol sherry (women). Us kids have got White’s lemonade and Smith’s crisps. At around 7 o’ clock, Dad switches on the radio and tunes it in to the station he wants. A sort of anxious silence descends on the room and I’m suddenly aware of the odour of Brylcreem and the liver and kidney stew consumed earlier. 13 days earlier – the 6th February – BEA flight 609 from Munich had crashed on the runway at Munich-Riem airport, making its third attempt to take off. On board had been the Manchester United team – The Busby Babes – officials, journalists and other passengers, en route to London from Belgrade. The aircraft had landed in Munich to refuel. Of the 44 passengers, only 21 survived the crash. 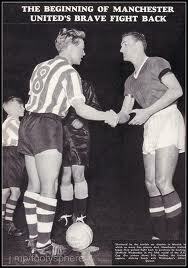 Amongst the dead were 8 of the Manchester United team that had played in a European Cup tie against Red Star, Belgrade. In the days that followed the crash, we spoke of little else. 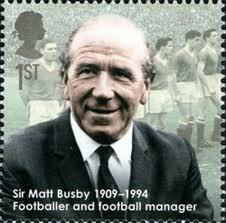 The manager, Matt Busby, was fighting for his life in hospital and had been read the Last Rights twice already. Goalkeeper Harry Gregg had behaved heroically, rescuing passengers from the burning aircraft whilst badly injured and concussed himself. We wondered, too, if the club could survive the disaster and continue to field a team. At that time, the Babes had caught the imagination of the football-crazy public, both at home and overseas. Challenging for a third successive league title and through to the semi-final of the European Cup for the second year running, the young team seemed set to sweep all before them. But tonight, in their first game since the disaster, United are to play Sheffield Wednesday at Old Trafford in an FA Cup 5th round tie. Assistant Manager, Jimmy Murphy has cobbled together a team of mostly reserve players and one or two shrewd acquisitions from other clubs. Dad turns up the volume on the radio as the teams come out onto the pitch and over the ether the roar from the 59,848 in the crowd sparks a similar reaction in our living room. Mum thinks that the radio commentator will do himself a mischief if he doesn’t calm down. The noise in the room dies down and we can hear the commentator – but he’s so choked up, he makes no sense. But his sobs reach us. Dad says; ‘They couldn’t lose tonight. All those young men were playing . They were all there tonight. How could they lose?’ And we all wept. So, if I seem a little tired and grumpy on Sunday morning, forgive me. I was probably up at 3 am watching another bunch of young men in red playing the beautiful game, mindful of the debt I can never repay. 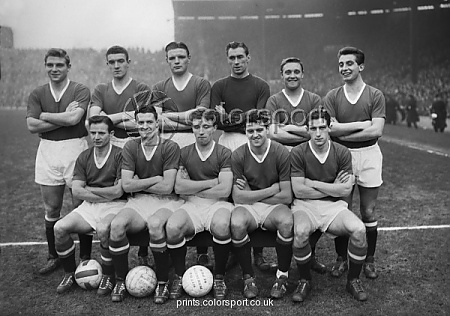 This entry was posted in Bio and tagged 1958, Manchester United, Matt Busby. Bookmark the permalink. Thanks, Steve. I appreciate your comment.